Cheap roundtrip flights from Brussels to Montreal from €255! Flydubai promotion code 2019 – 10% discount all flights! Cheap flights from London to Sydney, Australia already for £366! British Airways have greatly disocunted return flights between Brussels, Belgium and Montreal, Canada now offering cheap flights on this route already for €255! (Incl. all taxes and onboard meals. Checked luggage for extra fee). This is excellent option for anyone in Benelux planning to visit Eastern Canada in spring 2019 also end of summer season. Flights have one layover in London on your way. Remember you can not skip first leg of your outbound flight between Belgium and the United Kingdom..any flight you miss rest of your itinerary would be cancelled..
British Airways offer the cheapest flights from Brussels to Montreal from 6th to 26th of May or 1st of September to 5th of October 2019. Based on date of your outbound flight from Belgium to Canada. Max stay 3 months. Book this discount by 15th of March or until sold out..Below you will find our booking samples based on British Airways promotion as well as few travel date options. You can compare all the cheapest flights directly at website of the airline..Simply follow one of below links if interested. 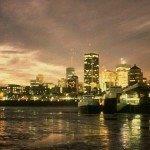 Need an accommodation in Montreal, Canada you can use service of Booking.com. Booking sample of cheap roundtrip flights from Brussels to Montreal from €255! In this case you would depart from Belgium to Canada on Saturday, 11th of May. Inbound from North America back to Brussels via London, UK on 25th of May 2019. Flights are based on current promotion of British Airways with one short layover in London Heathrow.